For the gamers out there, who enjoy the odd spin of the reels, you can combine both worlds with this incredible adaptation from Microgaming. Tomb Raider: Secret of the Sword brings our heroine Lara Croft into a dark and mysterious world, where she has one goal; to help us win! 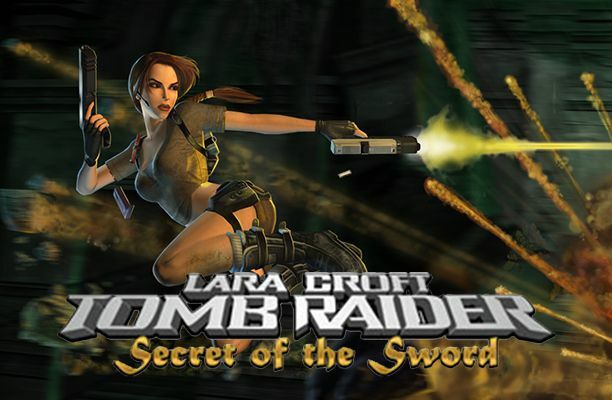 Tomb Raider: Secret of the Sword is a 5-reel, 30 pay line slot and it offers a lower RTP at 95.2%. We hope that it doesn’t have too much of an impact on game play but knowing Microgaming we don’t think it will. What we did notice was the intense music which is a welcome addition to the atmosphere. Symbols are interesting too in that they show Lara Croft in a variety of scenes such as a bike chase and shootout, plus there are the usual card symbols too. 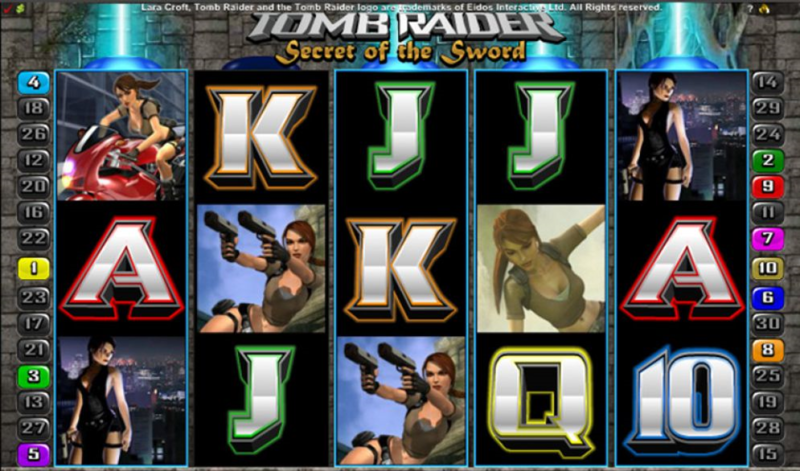 Bet Amounts – Betting on Tomb Raider: Secret of the Sword begins at 1p per pay line in play and can be increased to 20 per pay line in play. You can amend the amount of lines active, the coin amount and the coin level to ensure there is a good range of bet amounts for all. This means that if you were to play with the full 30 lines active you are looking at a minimum of 30p per spin and a maximum of £60 per spin at max level. Wild Symbol – Lara herself is your wild symbol and she will substitute for all other symbols except the treasure scatter and the passport bonus symbols. She is also your highest paying symbol offering a whopping x7500 coin win for landing 5 on an active pay line. Scatter Symbol – A fragment of glowing treasure is your scatter symbol and it will trigger the bonus spins round by landing 3 or more on the reels. Scatter wins also apply here so watch out for those being added to your line wins. Bonus Symbol – Lara’s passport is your bonus symbol and you will need five of these to trigger the Global Adventure Feature. In order to activate the feature, you will need one symbol on the centre mark of each reel. It seems a tough order but once it triggers it is definitely worth it. Super Mode Feature – Randomly triggering this is a welcome addition to the Tomb Raider: Secret of the Sword game. 5 bonus spins will be automatically awarded and during the spins, random wilds will fill multiple positions on the reels contributing to more wins and potentially big wins too. Super mode cannot be triggered during the bonus spins round, and it will never be triggered at the same time as the bonus spins either. But regardless of this it is still something to look forward to. Bonus Spins Feature – Landing three or more scatters will trigger the bonus spins round and you are also going to be allocated the rolling reels feature too. Once again as with the first game you will receive 10 bonus spins with a multiplier occurring between x1 and x5 the win. Rolling reels is technically an avalanche style addition, so as your winning combination symbols are removed from the reels new symbols will drop into place. As they do your multiplier will move up a step and will continue to increase with every new drop of symbols. Global Adventure Bonus Feature – Land a passport symbol on the centre spot of each reel to activate this feature. But you don’t have to land all 5 at once on Tomb Raider: Secret of the Sword, that would be nigh on impossible. Instead the game will remember when you have landed a passport symbol on the centre spot and highlight the reel in blue. Once all reels have been activated the game will begin and you will be taken to a new screen. A map will show you five locations that you can pick from and each location holds six treasures. Your task is to pick from the artefacts and each one holds either a treasure bonus, a trap or sword fragment. Sword fragment – allows you to move to another area to search for more artefacts and in turn bigger wins for the round. If you unveil the shootout bonus in the first stage, then you will be taken to a new screen and offered a selection of golden shields. To the right there is a list of cash values that are hidden behind the discs. You get to choose a disc and once you have the remaining discs will be shot out and the cash values removed from the list. This will continue until only your chosen one remains, and it is then awarded to your balance. When it comes to Tomb Raider: Secret of the Sword, Microgaming have upped their game where features and bonuses are concerned. There is a lot going on here and the wins certainly justify the complicated bonus features. What we enjoyed the most is the addition of the animations and the music, it all contributed to a much more enjoyable game play overall.